I've had this dress for ages, but i don't actually think i've worn this more than once, if at all which is a shame because its beautiful! The lace detail is so fine and interesting. I don't tend to wear white items of clothing, and i think the reason behind this dress hardly being worn could be to do with it's colour. Not that whites not a nice colour, but i just don't think it looks flattering on me, i prefer black as it's slimming and i think white makes me look bigger, but maybe that's just me being silly. I'm actually quite glad that i found this at the back of my wardrobe, i think it's definately something i'm going to have to wear again.I'm wearing a cross necklace to give this outfit a bit of a 'gothic' look to it, as oposed to the usual 'black & white monochrome' look. I feel very 60's actually. Come Wednesday, me & Sam will have been together for a year, must say it has been the best year of my life, and that's no exagerration. I was wondering if any of you had any ideas on how we could make it a special day and celerbrate at a cheap cost. So if you have any ideas, i would appreciate it so much if you could let me know! That dress is beautiful! I love the hem. This is such a beautiful lace dress! You are gorgeous! 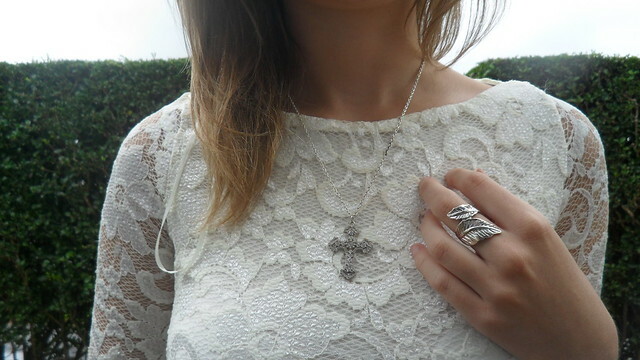 That dress is so nice and I love the jewellry too! That dress is stunning! :) It looks just like the one I've been spying in Jane Norman for months. I've been waiting on the price to go down, and last week it went UP! Sigh :( So I will go hunting for this one :) Thanks for the tip!